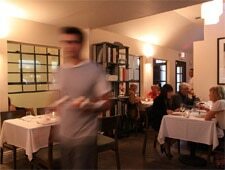 We like Mark Gold’s evolution of Eva from a bistro style to a more elaborate dining experience. : Over time, chef/owner Mark Gold’s restaurant Eva has evolved from a bistro to a more elaborate dining experience --- and we like it. He has kept the décor simple and contemporary inside, with black-and-white food photographs on the walls, and rearranged the patio to make it more welcoming. Gold still composes a short market-driven menu to showcase seasonal ingredients, therefore the selections change regularly. Dinner might start with an heirloom melon and onion salad with tomato, hazelnuts and basil or lamb belly with cured black olives. The poached egg on toasted cauliflower with mustard sabayon should be a menu classic. Continue with Alaskan halibut accompanied by chanterelles and baby onions and adorned with a very flavorful and decorative fennel flower. Gold’s risotto is quite interesting; it’s actually more of a cross between risotto and paella. The veal sirloin is tender and cooked perfectly, but the clear winner is the duck, seasoned with soy sauce, smoked sesame seeds and yuzu, and topped with spicy eggplant. Another example of Gold’s clean creations is the compressed melon dessert. It is just high-quality melon that has been vacuumed-pack to concentrate the taste, and then sprinkled with smoked sesame seeds. Chocolate lovers may choose the chocolate terrine. 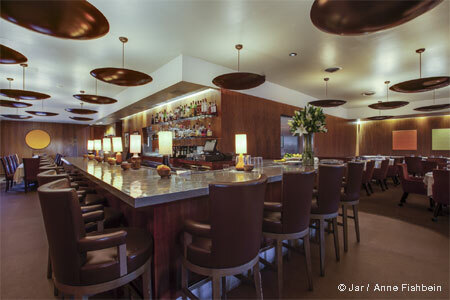 The wine list is short and reasonable, with a higher-priced "reserve" section featuring mostly French offerings.